The Chief Executive Officer (CEO) of Brussels Airlines, has warned governments of the three most Ebola affected countries in the Mano River Union basin in West Africa, to ensure strict medical and prevention adherences in order to prevent Ebola-infected passengers from boarding their aircrafts, as“any passenger tested Ebola positive on board Brussels Airlines will provoke an automatic suspension of flights to the three countries of Sierra Leone, Liberia and Guinea”. Brian Gustin, was addressing Ambassadors of the affected States of Sierra Leone, Liberia and Guinea, and Ghana, the incumbent presidency of the Chair of the ECOWAS Authority Heads of State and governments on Tuesday, 4th November, 2014 who had paid a courtesy visit to the headquarters of Brussels Airlines at Zaventem Airport to meet with the CEO and his Deputy as part of the Ebola diplomatic efforts manifested by the embassies in the fight against the deadly Ebola disease in the sub-region. The CEO recounted to the four Ambassadors and delegation, the unfortunate incident that took place on Monday, November 3rd at the airport when a female passenger from Sierra Leone vomited as she alighted from the aircraft and experienced high fever. “This situation caused panic not only to our crew members, but also to the general public in Belgium when the news was aired by the local media. However, we thank God that the tests were carried out lasting six hours and proved negative”. The CEO continued that, the said passenger must have been experiencing headache and had apparently drank some paracetamol tablets to ease the fever, which enabled her to board the aircraft in Freetown, undetected. “This is unacceptable. The travelling passengers must be honest enough to disclose their correct health status and not try to put their countries at risk. We are doing our best to service these three countries, despite tremendous pressures from our crew members, families and some members of the public for us to stop flying to these Ebola affected countries. We are committed to continue, but we need the support of the travelling passengers as well as the relevant government authorities to ensure that stringent measures are put in place at the various airports to prevent anyone with the slightest symptoms of fever from boarding our aircrafts. At any time we carry a passenger who proves Ebola positive, will live us with no alternative but to suspend flights to all the three countries with immediate effect”. He said, so far they are satisfied with their operations in the three countries. “Since the outbreak of the Ebola epidemic, we have carried about 15,000 (Fifteen Thousand) passengers to date from the three countries, and no one has travelled in our aircraft, fell sick on-board and proved to be Ebola positive”. Brussels Airlines Vice President, Philippe Saeys-Desmedts, who was also present at the meeting said, the company’s Country Directors have been instructed to increase their daily contacts with the relevant government authorities to help reduce the risk. 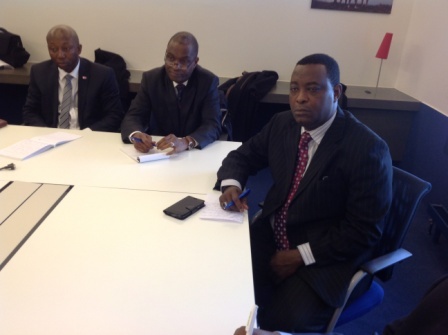 In responding, Sierra Leone’s Ambassador to the Kingdom of Belgium, Ambassador Hon. Ibrahim Sorie stated that the group was there to thank the Board of Directors, the CEO and his team for keeping Brussels Airlines continuously flying to the affected states and to empathize with them for the formidable challenges including stigmatization of the airline as an Ebola airline. 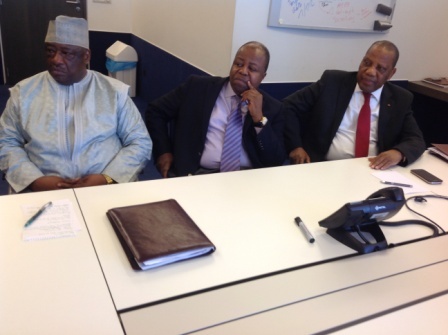 Each of the Ambassadors took time to provide updates on the status of the Ebola disease in their various States. Ambassador Sorie also appealed to the Brussels Airlines management to immediately notify the Embassy of the affected State on cases like the incident that happened on Monday at the airport. All the Ambassadors committed themselves to convey the message of concern from the Brussels Airlines management with regards to passengers’ comportment and sobriety. On the way forward, the Ambassadors welcomed the decision by the airline’s management to put a medical doctor on board the flights originating from the affected countries.